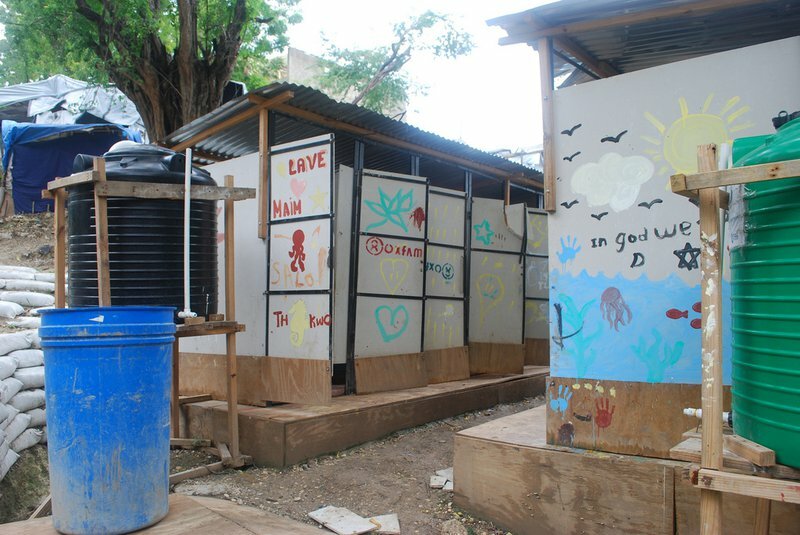 Haiti: Oxfam latrines and sanitation facilities. Credit: Flickr/ Kateryna Perus/Oxfam. CC BY-NC-ND 2.0. The public heat generated by Oxfam’s scandal is focused on three issues. First, the absolute importance of protecting vulnerable people—project beneficiaries and collaborators, staff and volunteers; second, accusations of hubris, arrogance and self-serving behaviour by aid agencies; and third, the bigger questions of whether and how aid makes a difference. How are these issues connected? The mechanisms required to protect vulnerable people from being preyed on by staff who abuse their positions of power (in any sector) are well-known: more care and better vetting in recruitment, including a mandatory phone call to previous employers; more open whistle-blowing policies; better induction and training of staff; an emphasis on clearly articulated and modelled ethics; and a commitment by managers to act swiftly and decisively, and steer away from impunity. Although the aid sector can and should work collectively on an informal basis to strengthen these mechanisms and attributes, I think it’s a mistake to establish global regulations or a mandatory database of international development workers, because the sector isn’t really a single entity in the way that (perhaps) medicine is, and because of the messy, unpredictable, international nature of aid. How, for example, is a young woman in the Philippines supposed to register as an aid worker before the disaster which leads to her recruitment even happens? I also fear that external regulations can be the enemy of the proper internalisation and ownership of ethics. On the second issue of self-serving corporate behaviour and hubris, there is clearly a problem, but it isn’t quite as simple as portrayed in the media. Aid agencies have long backed themselves into a corner by claiming in their marketing and fundraising that they have ‘the solution’ to poverty, and the public, despite being far too intelligent to think that poverty can be so easily ‘solved,’ have willingly gone along with this narrative. When a willing buyer (the donor) and a willing seller (the charity) are both intentionally vague about the product they’re trading, they create a problem of accountability. So a flawed accountability loop has developed: you give me your money and I’ll take care of the problem while you continue to live your privileged lives. The seller is thus encouraged to create and sustain a narrative in which those who give money are making a difference through the charity’s actions—and to go to enormous lengths to protect this narrative when the real world threatens to undermine it. Hence, a narrative has emerged of western charities ‘saving’ and even ‘transforming’ non-western lives. The narrative is an integral part of the model, so it can only be changed by disrupting that model. The interest generated by the current Oxfam story gives us an opportunity to do so, but that means looking at the third question: whether and how aid makes a difference. Let’s divide aid into two categories for the sake of simple analysis: emergency aid and development aid. If providing help in natural or man-made emergencies is by no means easy, the task is relatively simple to define. There is a need to mobilise quickly, save and stabilise lives, and provide basic services to sustain and restore those who have been affected so that they can rebuild their lives. This should, of course, be carried out with all due care and attention so as to avoid the kinds of unintended negative consequences illustrated by the Oxfam scandal and described by Matthew Green in an excellent article in the Financial Times. It is also increasingly understood that conceptualising and preparing for post-disaster reconstruction should start as soon as possible, with the idea of “building back better” to create a new, more resilient baseline in terms of disaster-prevention and -preparedness, human rights fulfilment, fairness, empowerment and governance. This takes us into the realm of development aid. As soon as we do this, the problem becomes clearer. Perhaps with the exception of ‘religion’, ‘progress’ is the most disputed concept in the world. It’s what politics seldom agrees on, whether ideologically (left and right) or on an issue by issue basis, as in how best to provide health care, for example, or whether to subsidise farming, or if it’s worth destroying hundreds of acres of forest to mine potash, iron or gold; or perhaps even whether to leave the European Union. So questions of development are political questions. Should a country like Uganda use its limited fiscal resources to provide a mediocre quality of primary schooling to all children free of charge, or should it focus on shepherding a smaller number of brighter children through a better education system so they can play a leading role in politics, business and public service, and thus build a platform for further progress? How should a poor rural community allocate its farming land—only to those of the dominant language group or also to those who have migrated there from other districts? Should daughters as well as sons inherit land? Is stability more likely to improve children’s prospects, or should communities opt for a more risky process of transformative change? These are not primarily questions about aid. They are typical, political questions about progress. And like most political questions they don’t have simple, normative answers. Nevertheless, they are important questions that do need answers, and which the political system in a country like Uganda may choose to answer in ways that people in other countries might disagree with, absent as they are from Ugandan politics and social dynamics. The challenge for outsiders therefore—whether the UN, western governments or foreign NGOs —is how to play a legitimate political role without overstepping the boundaries of interference. This is probably hardest for western governments, who at one time, for example, were funding half the Ugandan Government’s budget. Legitimacy is perhaps a little simpler for foreign NGOs, at least in principle, because they operate on a much smaller scale and with less power to abuse. Nevertheless, it’s a critical challenge they must contend with. It’s hard to see how most Haitians would view Oxfam—and by extension other foreign NGOs—as having much legitimacy after what has come out in the past two weeks. But legitimacy is a subtle and complex notion; it’s not just about interpersonal behaviour and respect. What’s welcomed from foreign NGOs by local activists might be condemned as interference by their government—as current debates in Russia demonstrate. I once asked a Ugandan activist if the international organisation I represented could legitimately engage in political advocacy there. His answer was simple: pick the right issues and be effective, and you’ll be legitimate. So, for him at least, relevance and effectiveness confer legitimacy. The more foreign NGOs see themselves as activist agents of specific, contextually relevant change (and not just as service deliverers), the more they’ll need to recruit leaders—preferably citizens of the country concerned—who see themselves as activists too, within the fabric of indigenous civil society and politics. But they should go further. Challenging the status quo implies an element of risk, so to increase their legitimacy foreign NGOs also need to be ready to take risks, including the risk they will be closed down by the authorities even if this disrupts their organisational interests. Historians dispute the process of development or progress just as much as planners and politicians. So even from a vantage point in the future, it will be hard to know how and why change happened in a country like Uganda, and even harder to know how change will happen —and therefore how best foreign NGOs might contribute. So the Oxfams of the world must take an active part in, and support local groups to take part in, debates about these matters within civil society, holding up their own ideas and plans to scrutiny, and sharing lessons learned to further enrich the conversation. This can have the added benefit of helping to expand the scope of public debate and politics from questions of representation to questions of participation—to the policies governments should follow and the visions of the future around which societies might cohere. One way donors can help in this process is by moving away from models of funding which assume that cause and effect can be predetermined with confidence, and that consultation and political engagement can be carried out on the cheap. The same applies to Oxfam and its public narratives: by creating and sustaining the pretence that it knows what is needed, how to provide it, and how its interventions will work without unintended consequences, the aid sector risks denying itself the posture and resources—and perhaps even the legitimacy—to contribute to progress where it can. Thus, Michael Edwards is right that it isn’t gratuitous to link the Oxfam story to wider questions about aid. Indeed, surely we should seize this opportunity to do so.